I am what I sometimes feel like is a breed, a liberal Christian. As someone who really hates conflict I often find myself in uncomfortable situations as most of my family are conservative Christians as are many of my Christian friends. I also have a lot of non-Christian very liberal friends. Because I hate conflict I often just keep my mouth shut when things are said that I don’t agree with both sides. It’s super cowardly I know, and it’s not something I like about myself very much but my innate need to be liked, to not stir things up, to keep the peace, to not get into long heated discussions, etc. means I have a tendency to not speak my mind around these types of issues. Maryland has a ballot measure during this election to approve marriage equality for gay people, which I will be voting for. I haven’t really specifically talked about it with any of my Christian friends in Maryland, but I’m guessing many of them are planning on voting no. When the polls were showing that the marriage equality was likely to pass by about 10 percentage points I was content to continue with my status quo of kind of staying out of the issue, but now that the anti-marriage equality people have been making their final push and polls are showing the issue in a dead heat I feel like I finally need to speak out on the issue. I am not even going to touch on the theological issues of whether or not homosexuality is ok or not because I don’t think that is the issue at hand. I think Justin Lee from the Gay Christian Network, whom I have previously written about, does a great job of addressing how Christians on both sides of the issue of homosexuality can and should still love homosexual people. This is what I am talking about…love. The Bible I read and the God I choose to follow has instructed me to love. It is his greatest commandment to love my neighbor has myself, which means I should be treating others as I would like to be treated. I would not want anyone discriminating against me because I am different from them, so I will not discriminate against them. So many people seem to act in hateful ways to gay people and it makes my heart hurt. God calls us to love not hate. Jesus hung around with the people who were considered the worst sinners in his day. He did not condemn them. He did not spew hate at them. So I don’t understand where that comes from in people professing to be Christians. I had ended this post differently in my original writing of it, but someone just pointed out to me that instead of publishing my final post WordPress decided to publish some half written draft that ended with half of a sentence. I don’t remember what I actually said after this point in the post, so I’m just going to end it here. I am a Christian who will be voting yes for Maryland Marriage Equality and hope you will consider doing the same. I am so in love with this Calvin Harris song featuring Florence Welch of Florence + the Machine. I told you it wouldn’t be long before Florence showed up on this blog again. I was not wrong. Florence is just as dreamy, trippy as ever and the beat that Calvin Harris is putting out in this song is fantastic. Mark Blankenship (who I have previously written about) provides a great write up of the song, so that is all I’m going to say about it because you can just go read his much better analysis. FYI, the video is pretty violent. Just wanted to give a heads up to anyone who is violence averse. If you are, you should still listen to the song, just don’t watch while you’re listening. If you read Mark’s blog post you’ll see that Calvin Harris previously remixed Florence + the Machine’s song Spectrum, which I was not aware of until now. I looked it up out of curiosity. I definitely like the original better in this case, but here it is in case you’re curious too. For anyone not familiar with the term a phlebotomist is a medical lab technician dedicated to drawing blood. As someone who has to give blood more frequently than most people and who has crap veins I really appreciate a phlebotomist who can do his or her job well. I was thinking of this today as I looked down at my wrist which is covered with a gigantic bruise from the blood draw I had on Thursday. One of the medications I take to help control both my arthritis and Crohn’s disease is actually a low dose of a chemo drug. It is extremely hard on my liver. Thus I am required to have my liver enzyme levels checked every few months to make sure it is not in fact destroying my liver. This is also why I am not allowed to drink lest I tax my liver any more than it already is. My current insurance allows for my rheumatologist’s office to draw the blood and send it away for testing. Their office does not have a dedicated phlebotomist so my blood is drawn by whatever nurse happens to be working with my doctor on the day of my appointment. As I have mentioned I am the veinless wonder. People consistently have difficulty finding veins on me when they want to draw blood. The one time that I tried to actually donate blood the person spent awhile looking at my arms for a vein, finally told me she couldn’t find one bigger than the needle they use, and sent me on my merry way. Last Thursday the first nurse took a look and couldn’t find any veins and gave up without even trying to stick me. This is not a rare occurrence. She went and got the infusion nurse, who presumably should be better at finding a vein. That nurse searched around the crook of both my arms, gave up there, looked at my hand, gave up, and finally settled on the top of my wrist where she proceeded to stick me multiple times and root around in there until she finally got in a vein. Sadly, again none of this is rare when I’m getting my blood drawn. I always hate when they go for the hand or wrist because it hurts a lot more. I always say it’s a good thing that I don’t have an issue with needles or blood. I also like to joke that I could never be a heroin addict because I would never be able to find a vein to shoot up in. All this hoopla makes me really appreciate a good phlebotomist who can get me on the first stick, which is a rare thing. The insurance I had previously for some reason would not let my rheumatologist’s office actually draw the blood, but instead insisted that I go to the lab facility to have it drawn. That wasn’t convenient for me, so instead I would drop in to my primary care physician’s office and have my blood drawn and they would send it off to the lab for me. I haven’t had my blood drawn there in years, but the dedicated phlebotomist they had working was the best person I’ve ever had draw my blood. She never missed a single time. Because I saw her quite frequently she knew that I was a hard stick. One time I went in to get my blood drawn and she was on a break or busy doing something else so one of the nurses in the office took me in and was about to draw my blood. The phlebotomist happened to look across the hall and see me sitting there. She leapt up, darted into the room waving her arms yelling don’t do it she’s a really hard stick. It was like one of those things you see in the movies where someone is trying to stop something and they’re flying through the air in slow motion screaming NOOOOoooo. So she rescued me from being stuck multiple times. It was one of my best experiences in a doctor’s office ever. I definitely miss her skills with a needle every time someone else draws my blood. For now, I’ll just hope the next person who draws my blood has half the skills she has. I have finally, FINALLY found a water bottle that works for me. Seriously my house is a veritable graveyard of discarded water bottles that did not stand the test of time. I have tried many, many water bottles and they have all failed the leak test until now. I want a bottle that is both easy to drink out of, but that is also not going to leak all over my stuff. I have tried everything from generic cheap bottles I have come across, to store brands such as REI, to more well-known and respected brands such as Nalgene and Camelbak. I have tried different designs. They have all failed because either the lid pops open to easily or something in the bottle design allows for leakage either around the opening or around where the bottle connects to the lid. About a month ago I finally found a bottle that seems like it is going to work for me. My friend Jenny had actually mentioned this particular bottle made by Contigo on her (maybe now defunct) blog quite some time ago, but I had never seen it in any stores when I had been on a hunt for a new water bottle. I actually have one of Contigo’s self-sealing insulated mugs for drinking my hot tea out of in the winter and am happy with it. That combined with Jenny’s recommendation made me decide to actively seek out this particular bottle after my recent water bottle fail. I am super happy with it so far. It’s easy to drink from. It doesn’t leak at all. It is fabulous. I definitely recommend it if you’re in the market for a new water bottle. Four years ago today my husband and I got married. He’s still my favorite husband. I kid. I mean he still is my favorite, but he’s of course also my only. I know I am a lucky, lucky woman. I am married to a very thoughtful man who goes out of his way to take care of me. I’m pretty sure I get more than I give in this relationship. It’s a ratio I enjoy, but I will use this space to let everyone including my husband know that it does not go unnoticed. For example, just last week I was having a crappy day at work and it was late night working the reference desk. I complained via Twitter about having a headache and being mad at myself for forgetting to restock the Tylenol I carry in my purse. Without me even asking my husband drove to my office and dropped me off some Tylenol. What a sweetie. We have a great time together and he’s usually game to go along with my crazy schemes. I also can’t express how happy I am that he too does not care about football or baseball so I don’t have to spend every weekend plus at this point almost every other night of the week watching a bunch of sports I don’t care about. He may not be the perfect man, but he’s the perfect man for me. Happy anniversary Paul, I love you. 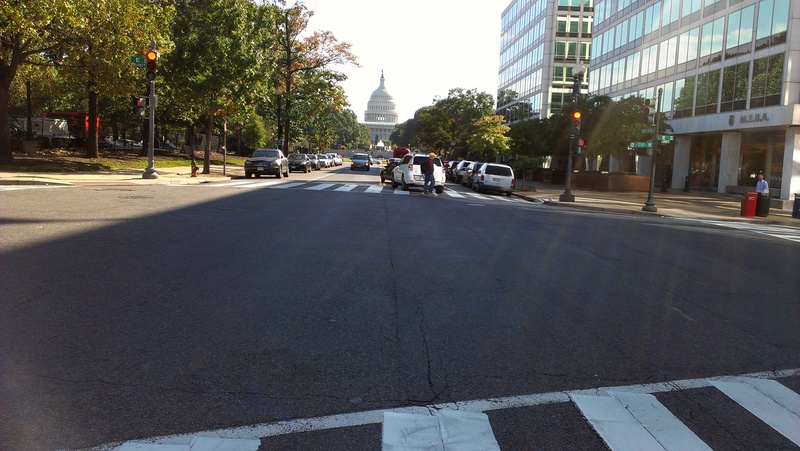 Yesterday my husband and I went down to DC for our friends wedding. I’ve been to a lot of weddings and all of them have some touches that reflect the personalities of the bride and groom. 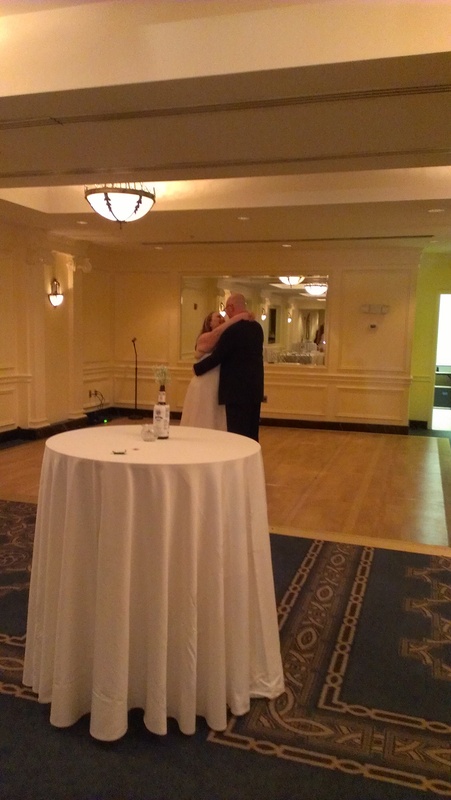 However, both this wedding and the last wedding we went to previous to this one were both memorable for how well they encompassed who the couple is. The two weddings could not have been more different in how they accomplished that feat because the couples themselves are very different, but I appreciate how much work they went to make their weddings truly unique for them. 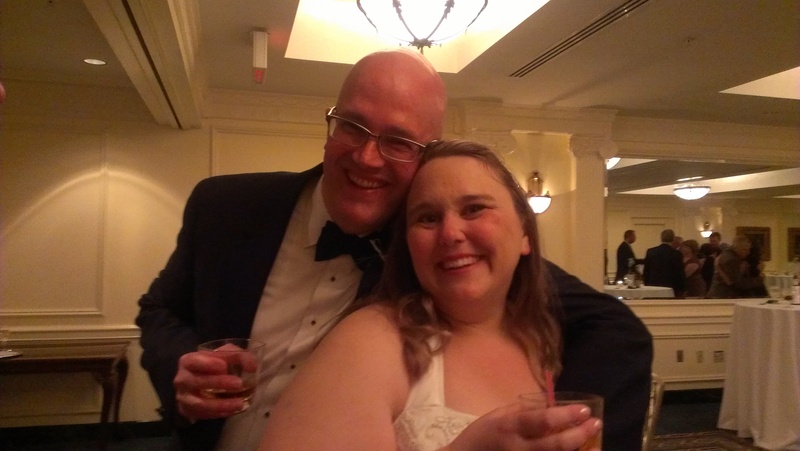 Ed and Kate live in DC and very much love their adopted city, so it was only fitting that they got married in an historic DC hotel within shouting distance of the Capitol. Ed is a friend my husband met online long before most of us probably knew what the internet even was, so you know there’s a lot of technology nerd there. Hence the fact that there was an official hashtag for the wedding and people were encouraged to live tweet the ceremony. 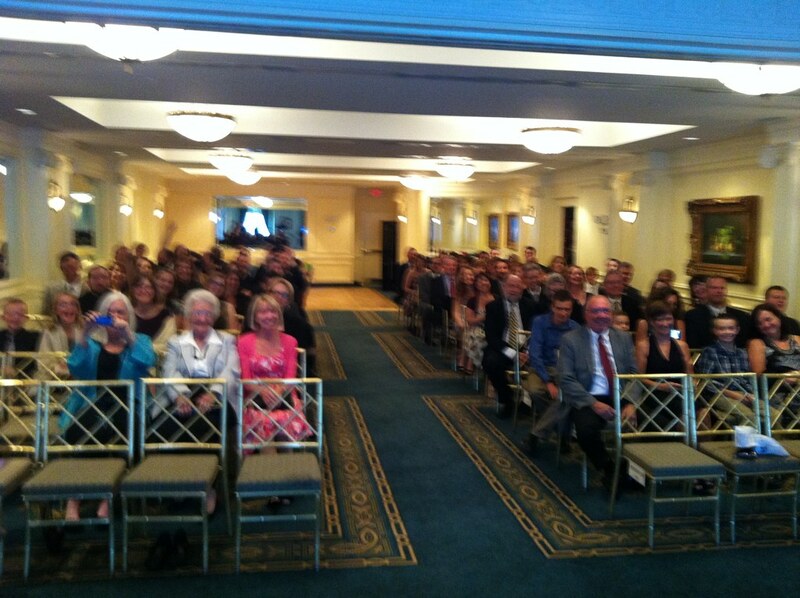 Even the groom took part tweeting this picture right as the ceremony was starting. The tenor of the music for the entire evening was set from the very beginning with music for the ceremony. With Ed coming out to “Top Hat, White Tie, and Tails” from the Fred Astaire movie “Top Hat” and the rest of the wedding party processing to “Take the A Train” by Duke Ellington and Ella Fitzgerald. I have zero recollection of what the bride actually processed to or their recessional song, but I’m sure you get the drift. This was the type of music being played the entire night. None of your usual wedding music being pumped out by a DJ. Instead a playlist thoughtfully put together by the bride and groom that very much speaks to who they are. The ceremony featured a reading from Sandol Stoddard Warburg’s “I Like You” performed by three of their nieces, which seemed very fitting. One of the most unique things about the ceremony though was their unity ceremony. A lot of people use unity candles. I got married on the beach so my husband and I did a sand ceremony. Ed and Kate, who are huge lovers of cocktails, actually did a unity ceremony featuring the creation of a cocktail. 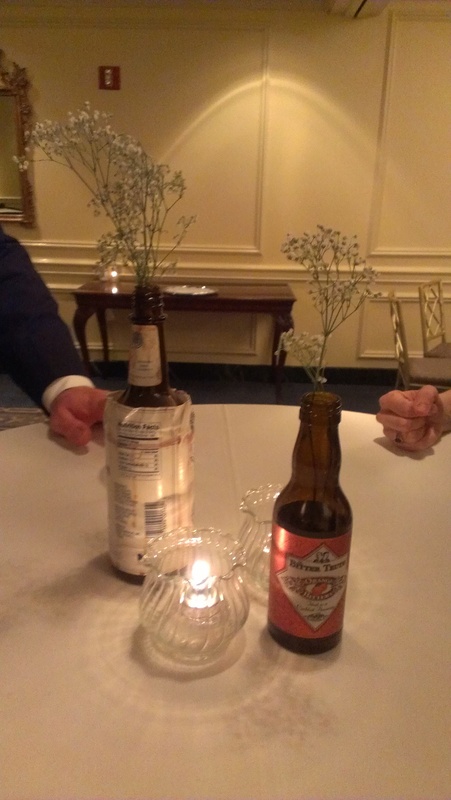 I suspect that is the first and only time I will see that at a wedding. 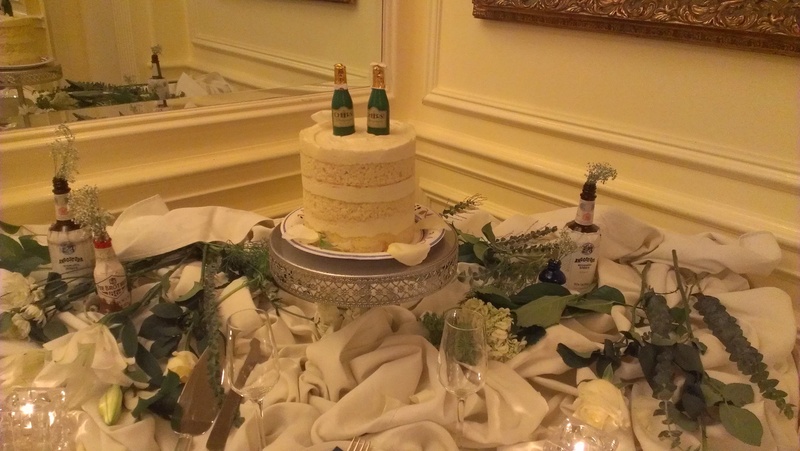 and their cake toppers were little bottles of champagne. 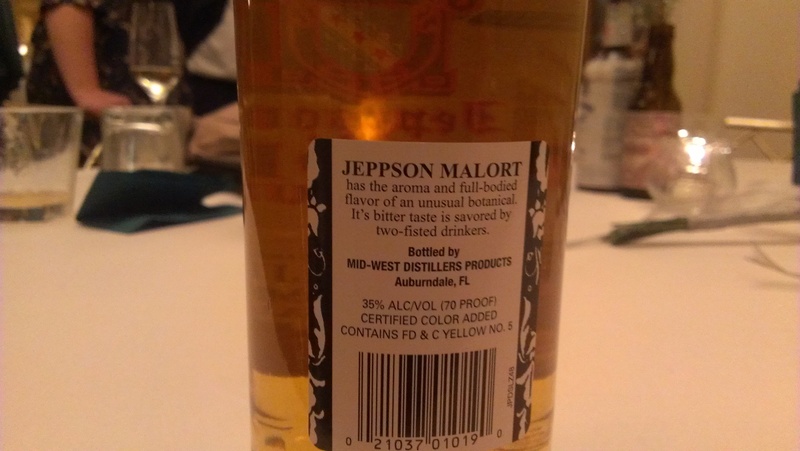 One of the groomsmen gifted the bride and groom at bottle of Malort, which apparently some awful whisky(?) that is difficulty to find outside of Illinois and is preferred by bikers in the state. I was just amused by the label which read “It’s bitter taste is favored by two-fisted drinkers” including the erroneous apostrophe. Classy. Based on the faces the bride and groom made while tasting it, the label is definitely the best thing about it. Speaking of the bride and groom here they are. And here they are enjoying their last dance. Wait you didn’t think the wedding festivities ended there did you? 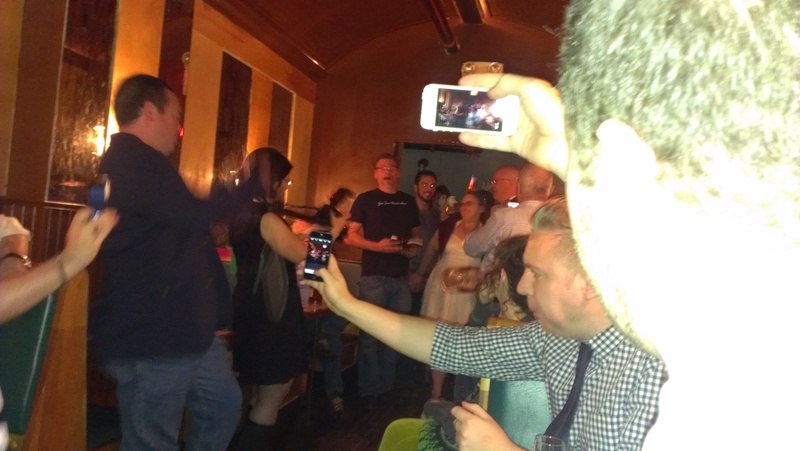 After the official wedding, the party moved over to The Passenger, which is a bar in DC and one of their regular haunts. There a second ceremony full of ridiculousness performed there. 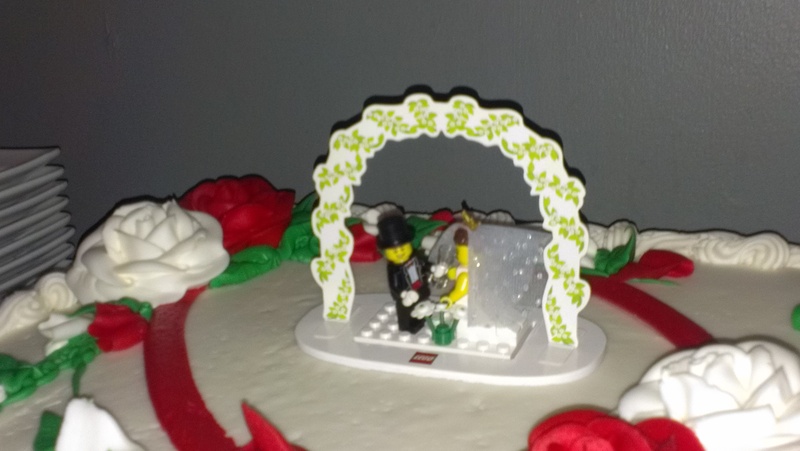 It was complete with another cake this time featuring a Lego cake topper. It was a lovely wedding that was a perfect reflection of the bride and groom.